One of the tenets of trauma surgery, handed down for generations, is that we should pack the abdomen to help manage major abdominal hemorrhage. “All four quadrants were packed” reads the typical operative note. But how exactly do you do that? Sounds easy, right? Prepare. 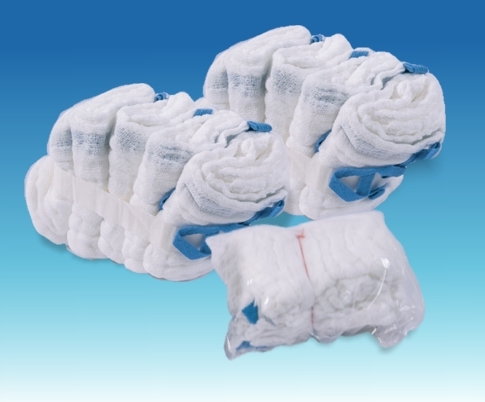 Have your scrub nurse fluff up about 20 laparotomy pads in advance. The point of packing is two-fold: soak up blood, and stop bleeding. Fluffed up pads work better than the flat, rolled up pads shown above. And you will need them fast, so have a supply ready. Do you really need to pack? Your patient is hypotensive, and you are convinced the abdomen is the source. You run to the OR, open it and… no blood. So don’t pack. It won’t slow down the (lack of) bleeding, but it is possible to cause serosal tears or worse. Just figure out where the bleeding is really coming from. Be careful. Don’t just jam them in there. Carefully place pads over and under the liver. Carefully place a hand on the spleen and push toward the hilum so you can place pads between spleen and body wall. Try not to cause more damage than is already there. Penetrating trauma: Pack where you know (or think) the penetrations are first. Basically, if it’s not bleeding there, don’t pack there. Blunt trauma: Pack the upper quadrants first. This is where the money is, because the liver and spleen are the top culprits. Then pack the lower quadrants to soak up shed blood. Once packed, check for successful control. If bleeding has stopped (or at least decreased significantly) stop and wait for anesthesia to catch up and continue your massive transfusion protocol. If bleeding continues, remove packs from the offending area and try to obtain definitive control. This is now the patient’s only chance, since you have now determined that you can’t stop the bleeding with packing. Remove packs in the proper order. In blunt trauma, remove the lower quadrant packs first. They’re not doing anything and just take up valuable space. In penetrating trauma remove the packs in the area of the injury first. Get an xray to confirm that all packs are out at the end of the case. Self explanatory. It’s easy to lose a few in the heat of the moment. I’ve seen two bundles (10 pads) left over the liver in one case decades ago! On Monday, I’ll write about the importance of the final x-ray when the abdomen is closed.